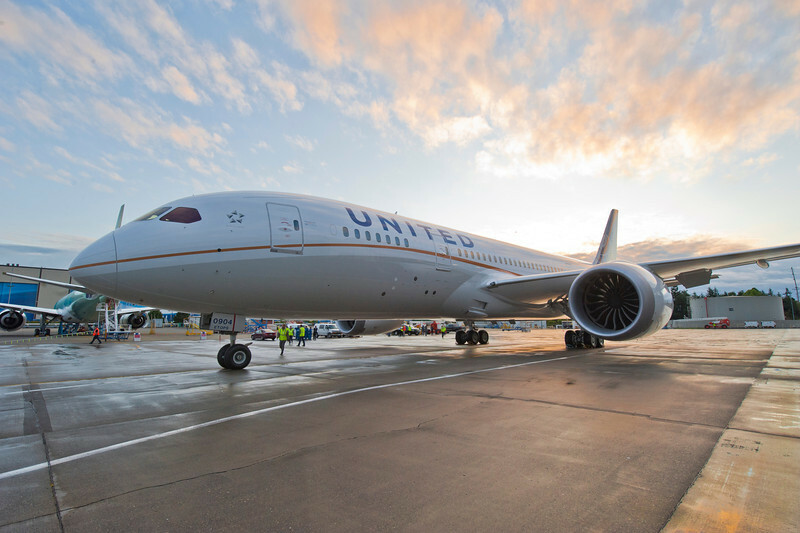 This article is on how to get the most out of an award redemption on United – American has different rules so that’s going to be a different article. This article applies to tricks that can be done with international travel. The rules for this can be found here. What are our big bullet point items here? Two open jaws are permitted per roundtrip award. For example, you can fly from Newark to London and return from Paris to Washington Dulles. A stopover is permitted on roundtrip award travel only. One stopover is permitted, unless otherwise noted. Additional mileage may be required for Saver Awards within the continental U.S., Alaska and Canada. For travel booked on or after February 1, 2014, a stopover is permitted only on certain roundtrip itineraries. Additional mileage may be required. The post Feb 1 changes are new – we’ll see how they affect an itinerary I try to create! A learning experience for us all today. An open jaw is basically a pop in/out of a different airport. This means one can start and stop your trip in a different airport. Or do so in the middle of a trip. Or both, hey we’ve got two! It’s really the best way to stretch the points and get the most out of them. A stopover is pretty straightforward – we get to stop in a city for a period of time. An easy way to take advantage of a stopover is to simply pick something on an existing route that you’d like to visit. 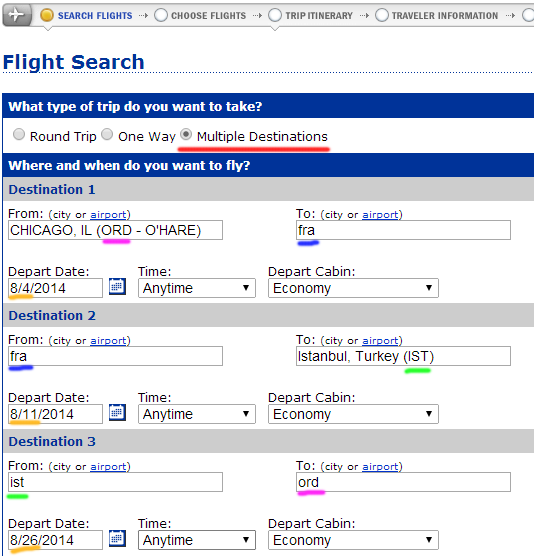 For this example I’m going to use Chicago O’Hare (ORD) to Istanbul (IST). I’m going to fish in August for seats. Keeping it simple this post is going to be all about economy; you will need more fishing to find business availability, which is what I would be personally looking for. 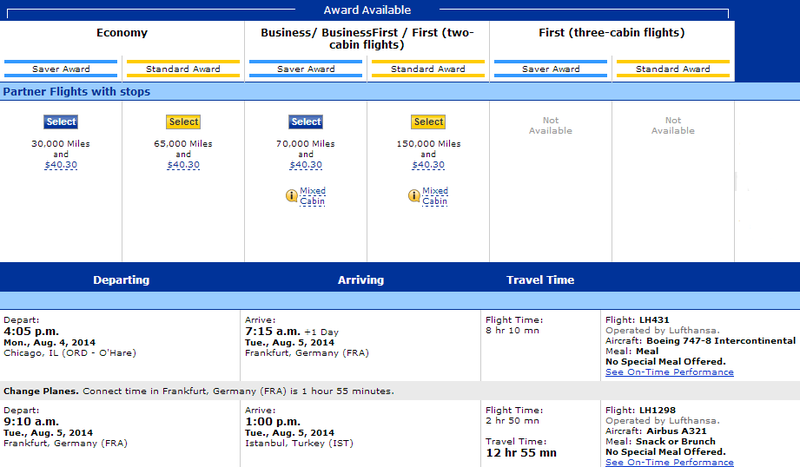 Great – we’ve got a flight there through Frankfurt – even on Lufthansa – a very highly rated airline. Making this easy I’m just going to say that we want to stop here. What’s the full ticket look like? 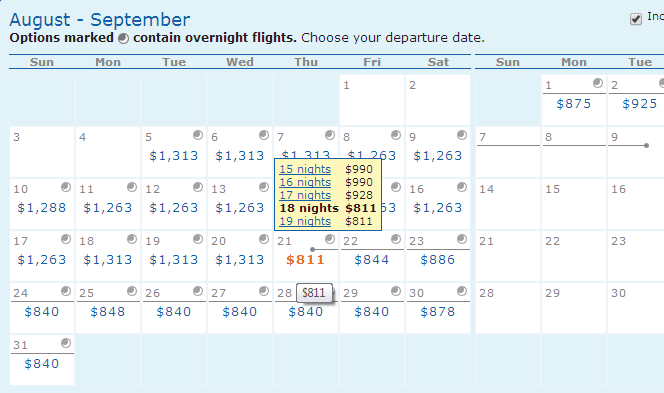 So around the same time, $1,263 is the best we can do – if that is even bookable (I’ve often found fares to be much higher when trying to actually book a flight off the search results.) At that rate we’re at 1.9 cents per mile. Looks like the season drops off and if we go later we can even get down to $811. 1.17 cents per mile – on the low end of the redemption scale. I try to extract 2-5 cents per mile of value out of a redemption, which is definitely what you get on a business seat, although they do take more effort to find. Is the trip worth booking as is though? Certainly a resounding yes. What else can we do leveraging these rules though? Well we get a stopover – so let’s stop in Frankfurt and see it. Why not, it’s on the way. Change the search to a mutli-city search. We’re hitting more airports – can’t get around their taxes and fees, which one pays for with cash and not points. Redemptive value? ($1783.90 – $182.40)/60,000 = 2.67 cents per mile. Nice – plus now we get to see Frankfurt and Istanbul. Sweet! The same points cost of 60,000 miles either way. Replicating with cash for any airline/any set of flights (but same days – not sure how to add date flexibility while keeping multiple routes) – I found a United/Lufthansa combo for $1521. If I replicated those exact flights the taxes/fees may be lower, but ignoring that we are clearly in a solid reward space; this is a good redemption. So this is great. However, we can do even more! We took advantage of a stopover – but not one of the two open jaws we are allowed. Let’s crank this up a notch. 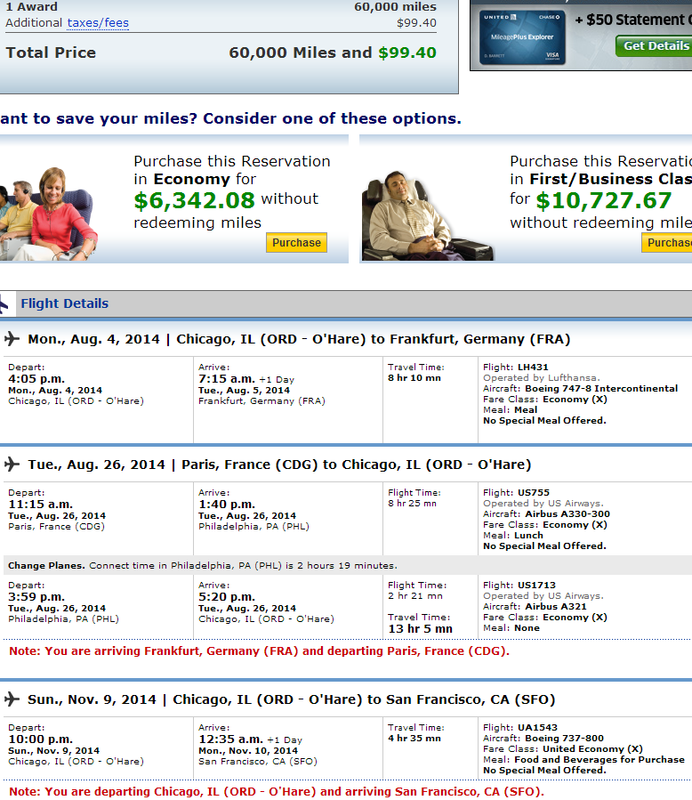 How about we fly to Frankfurt, bounce around, and come back home from Paris? That’s an open jaw – and we don’t have to come back to a city we’ve already seen. 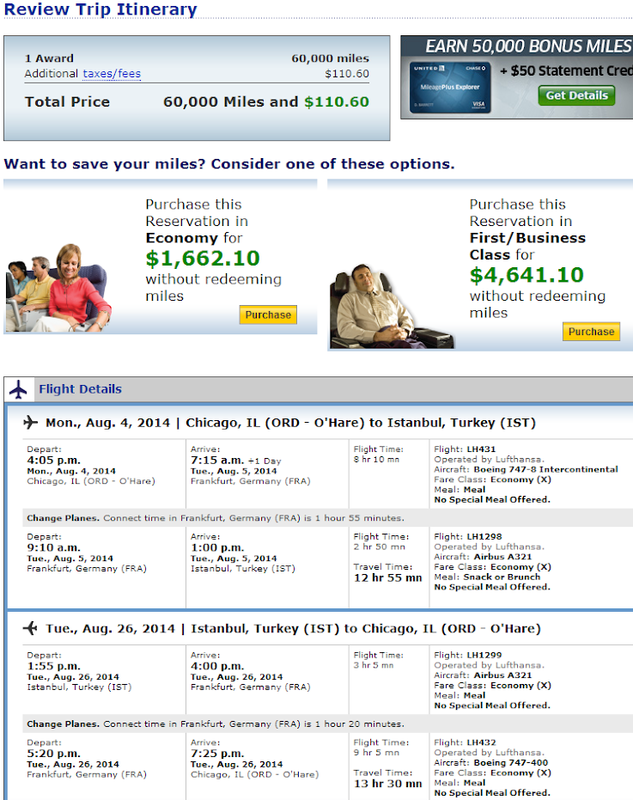 We can use our stopover in Chicago… then go on (within a year) to San Francisco, the second open jaw. All that for 60,000 miles and $99.40! 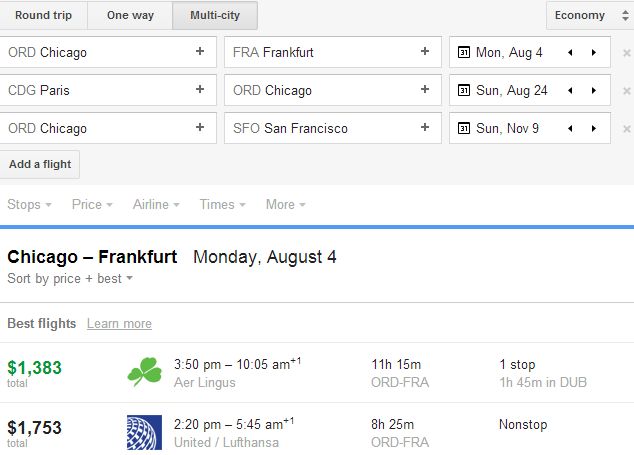 A surprisingly cheap Aer Lingus + US Airways replication from google below. Pretty good redemption though – we got to explore Europe then take an additional North American trip here for no additional points cost, and a bit in taxes and fees outside of the airline’s control. How about even doing this first class? What if we make the second open jaw an international one? Ignore the note about me not having enough miles here and the need to buy some more – this redemption is for 175,000 miles and $90. Surprisingly low on the taxes and fees there. Only one of these legs is in business (two class plane) – the rest are in first. I actually think the sweet spot for redemption is business but I had an easier time poking around and picking up first availability. My cheapest near replications in business only were $5,438 and first over 10k. I think google can’t actually handle pricing this type of ticket very well in the premium cabin space, although it did a good job for economy. 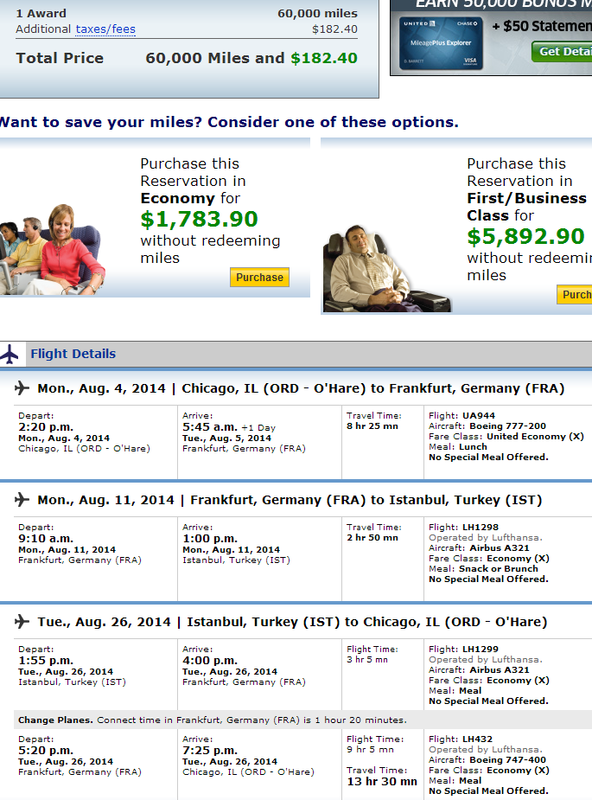 We get great value even using the google business class only price; ($5,438 – 90)/175,000 = 3.1 cents per mile. The third leg (the ending one-way in the above examples for a second open jaw) inherits the class of service from the prior flight. These could have been booked as economy leg, business leg, business leg, with no additional cost for the last leg. None of these tricks are available on one-ways – only round-trip tickets. All travel from start to end of the itinerary must be completed within a year. Travel further from North America requires additional points – which is why going to San Francisco was basically free, but why I had to pay the extra denoted above to get to Brazil. Availability in economy wasn’t too tough; finding premium class of today for this particular time period was a little trickier. The on the way stopover was no big deal, although adding on the “free” one-way/2nd open jaw in the above examples meant the second leg of the trip was limited to a very small number of flights. Had to fish to find one with a premium class cabin available with the saver price. The open jaw locations must be in the same region. You can’t fly into Paris and fly out of Dubai. Sometimes airline agent skill/helpfulness comes into play while trying to book a trip via them rather than online. United’s system is priced by computer so it likely is what it is if you call them up and try dictating an itinerary. I recently had a SE Asia trip with a 3rd leg going to Buenos Aires – I was unable to book the trip online with that last leg; the website kept spitting out an error. I was however able to book it over the phone with an agent. We need a one way now to get home of course – which could be bought with cash or points. American actually has a nicer policy using a similar trick for international one ways… We’ll save that for another article however. Daraius and Emily over at Million Mile Secrets have more examples of how to use these tricks as well. ← Is This Worth the Time and Effort? Do you know how many segments United will allow this way? It’s hard to create routes without lots of legs when you are not based at a major international hub like Chicago. For example, would this system prevent me going from Denver to Frankfurt to Denver then to my small hometown airport SCE (which only flies via ORD or IAD). 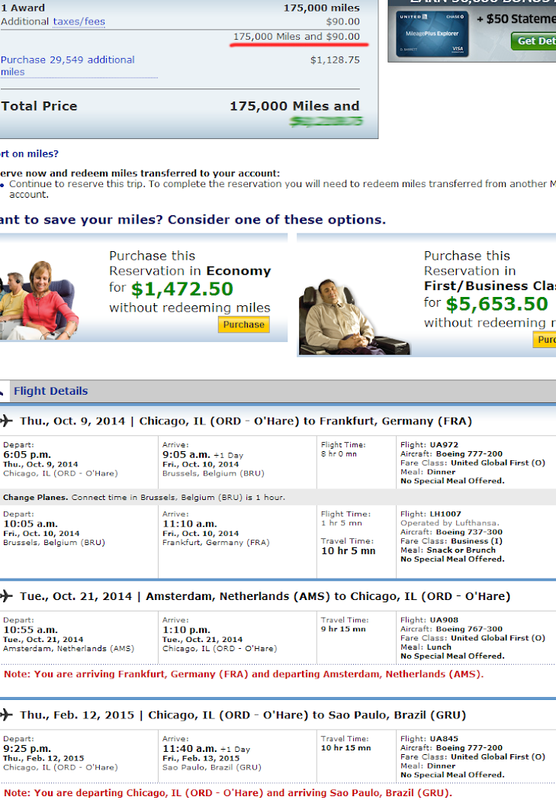 So the desired route would something like DEN>ORD>FRA>ORD>DEN>ORD>SCE. FRA is the destination and DEN the stopover, flying the last DEN>ORD>SCE at a later date. I am sure that’s not allowed but I would like to understand why. Maybe it would be allowed if the stopover was ORD and the ORD>DEN leg was omitted? two itineraries to combine but now you’ve got all the same flights in there and basically made it seem like you do live local to ORD. can use points for business class on itinerary 1 and cash on the 2nd for economy and come out pretty well. afaik – those both seem valid routings to me.